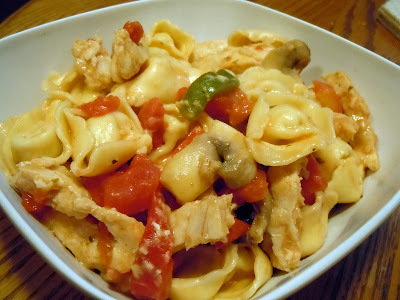 I love tortellini, but I definitely don't cook with it as much as I'd like to. Maybe that's a good thing for my waistline. 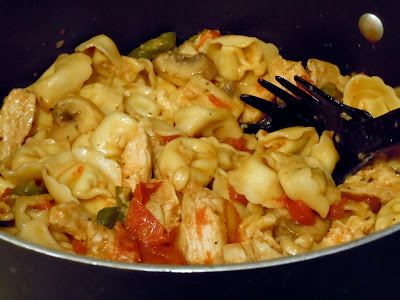 But when my mom was explaining the tortellini dish she made for my dad and brother the other night, I couldn't wait to create something similar. Lately I've discovered that a lot of my inspiration for new recipes comes from dishes I hear other people talking about. If it sounds good, I know right away that I want to try to replicate it without getting the recipe. Since I'm one of those people that needs to follow recipes line by line, I figure this is a good first step! I used what I had in my pantry and this turned out awesome. It was full of flavor and exactly what I was hoping for. I even had it cold for lunch the next day and it was still just as good. Hope you enjoy! To cook the chicken, heat a grill to medium-high heat and spray with cooking spray. Place chicken on the grill and cook until the chicken is no longer pink, about 4 minutes on each side. If you do not have a grill to use, preheat oven to 375 degrees F. Place chicken breasts on a greased baking sheet. Bake 20-25 minutes or until chicken is cooked through. Once chicken is cooked, slice into small strips or cubes. Meanwhile, cook tortellini in a large pot of boiling water for 6-7 minutes. In large skillet, heat canola oil. Add peppers and mushrooms. Saute for about 4 minutes or until tender. Add the diced tomatoes and dressing. Continue cooking until the mixture starts to boil. Add the cheeses and stir until melted and well combined. Add the cooked chicken to the mixture. Drain tortellini and add to the sauce. Mix well and serve.